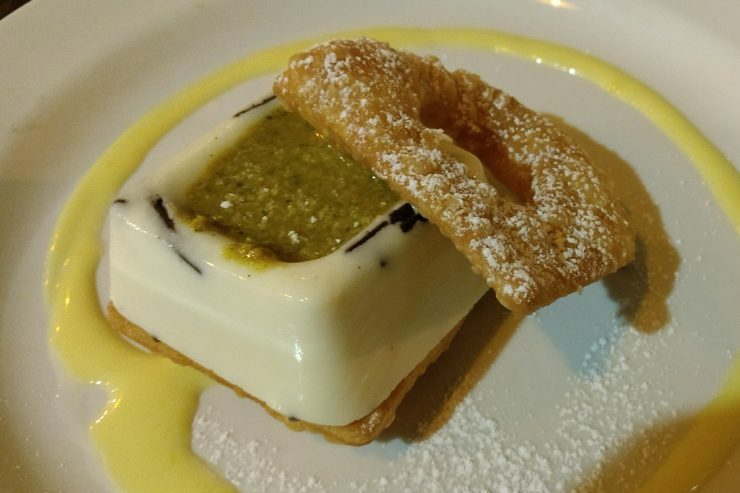 I continued my night of two Restaurant Week dinners at Osteria 2350 in the Strip District. I’ve passed by this place and its sister restaurant Cioppino many times, but always forgot about them when picking a restaurant because they are hidden on Railroad Street. Compare to my first dinner, Osteria 2350 was very laid back, but still classy enough to potentially serve as a future date or dinner with parents location. Two other great things about second dinner before even getting started were it was significantly cheaper and I was eating with 2 other people who were going to take lots of photos of their food. However, I was also a terrible dinner partner since I was 20 minutes late. I did try to put my order in view text, but the restaurant would not let them because it could get cold. That’s probably a good thing. As an aside, restaurants really need to stop dimming their lights so much. It really makes it difficult for all Instagrammers to take a quality photo. Even if you aren’t photographing your food, wouldn’t you like to be able to see well what you are eating or your dinner companions? For everyone not sitting with us and not addicted to taking photos of food, we look ridiculous as we were moving around the table and using phones to try to create extra lighting. My photos were fair. I think soon I’m going to be that annoying guy with a DSLR camera at dinner pretending to know how to take good photos. So my first course was a single fig filled with prosciutto and topped with gorgonzola. When this was served my first thought was this is not enough food, even for an appetizer and even after already having one dinner. Also, I usually have prefer my appetizers to be deep fried and overflowing from a basket. Then I cut into this single fig. It was packed full of prosciutto. 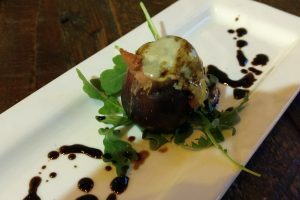 The combination of the sweet flavor on the fig, savory of the prosciutto and bitter creamy flavor or the gorgonzola mix for a delightful wart to start the meal. This is definitely something I might consider trying to make myself for inner party appetizers. 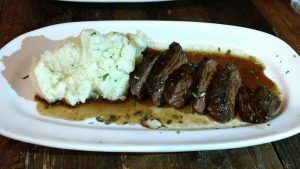 The main course was a hanger steak cooked medium with an apple and onion demi glaze and a cauliflower mash. This steak was cooked perfectly, tender and tasted great with the glaze. The biggest surprise might have been the cauliflower mash. It tasted like potatoes and I had no clue it wasn’t until I looked up the menu. I really hate it when I’m tricked into eating health and I like it. Again I took half the dinner home. I easily could have finished this meal, but I was starting to get past full. Finally dessert number 2 for the night. They served cannoli panna cotta. This was delicious. I expected something closer to a traditional cannoli. I was happy with what was presented to me. The cannoli filling was a little more gelatinous to have it hold its shape. The pistachio paste helped reduce the sweetness of the cannoli filling. Definitely a dessert l’d eat again. There are very few desserts I wouldn’t eat again. Leaving Osteria 2350, I was beyond full. Two Restaurant Week dinners in the same night is not something I would normally recommend. I totally recommend two non-three course dinners in the same night. I also recommend taking advantage of restaurant week to be able to experience new restaurants. At some point, I would like to get back to Osteria 2350 and try some of the more Italian style dishes on the menu.